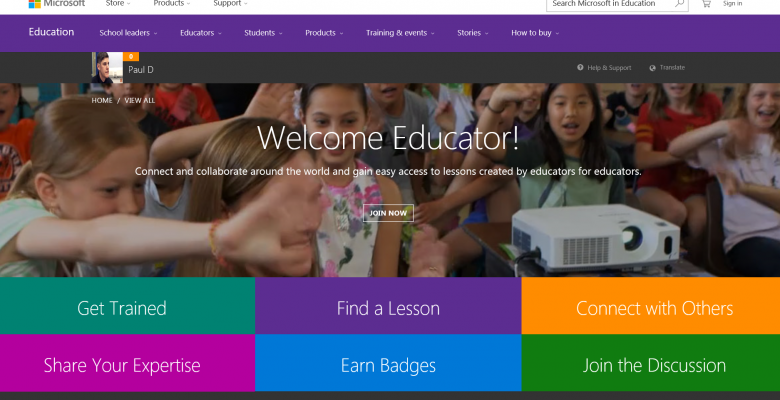 This week celebrates #MECWeek so it only seems right to write a blog entry about the training aspect of the Microsoft Educator Community. When your asked to access training resources online, and then sit a short exam, you always think the worst, a boring text and multiple choice questions set to catch you out! The ‘Get Trained’ section on the MEC makes the learning enjoyable and is aimed at educators and teachers so you don’t have to have a degree in computing to understand what your reading. The training and professional development is split into three sections – “Quick Tip Videos”, “Courses” and “Learning Paths”. The “Quick Tip Videos” are exactly that, short ‘how to’ video clips that have been uploaded to the MEC. If you want to know how to add audio to ‘Windows Movie Maker’ or how to use ‘One Drive’ to collaborate, this is the place to visit. “Courses” offers that immediate training that you might need. There are a number of courses available with each one offering you a quiz so you can test yourself with what you have just learnt. Each course is very simple to follow with a lot of the content being as video clips. For me this was a better way of learning as you could pause the video, or rewind it if you weren’t sure what you were being shown. This is what makes it different from classroom training. With classroom training you are set at one pace and I know I often find myself lost, or wanting to hear what was said again. Once you’ve completed the course you have the option to put what you’ve learnt to the test. The tests offers multiple choice questions and all the answers to these questions are in the course you have just completed. “Learning Paths” is the final section within ‘Get Trained’. This offers a more in-depth course, along with resources to help you develop a strong knowledge base of a product or a topic. Each ‘Learning Path’ is split into different courses so it gives you the ability to complete one section and then work on the rest at another time. Once you have completed all the courses within the ‘Learning Path’ then you will be ready to take the exam. Microsoft have added the fun factor to all this with their badge reward scheme. When ever you pass an exam you are rewarded with a badge. You can then show this badge off to everyone else by sharing it on social media. For me, it brings the same excitement as it did when I was younger, collecting football cards. This entry was posted in Blog, Microsoft and tagged #blog. Bookmark the permalink.